Crowder Painting was established by Carl Crowder in 1970. The plan was simple: to provide quality painting services to residents in Colorado Springs and the surrounding areas. Beginning in their early teens, Carl’s sons, Karl and Craig, worked alongside their father during the summer. They learned not only how to prepare and paint surfaces, but also how to treat customers right. When Carl retired in 2000, the boys took over the family business. Today, they operate it with the same eye for quality and commitment to customer satisfaction their father did, serving El Paso, Douglas, and Teller counties. Customers frequently comment on the painters’ ability and willingness to communicate with them about their needs and the job’s progress. 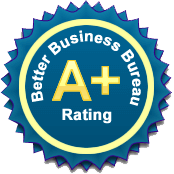 Crowder Painting has been an accredited member of the Better Business Bureau since 2006, and Karl and Craig are proud to maintain an A+ rating with them.